Take 1 to 3 capsules daily on an empty stomach. To achieve all benefits from the supplement, it is recommended to use it for at least a couple of weeks. Moreover, it is also recommended to take it on an empty stomach, as the gastric content can reduce absorption of the supplement components. Because of the high content of potassium, it is recommended to begin with the lowest dose proposed by the manufacturer. Ashwagandha reduces feelings of stress, supports energy and healthy sleep patterns. The supplement supports brain and liver functions. It is a valuable support for people suffering from depression. Standardized Magnolia Officinalis bark extract. Alleviates depressive and anxiety signs. 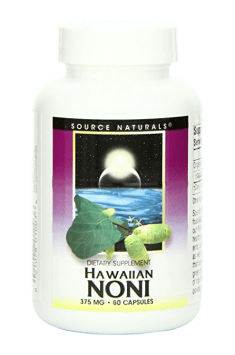 Noni fruit – derived from a plant of the Rubiaceae family, native mainly to the tropics, with therapeutic properties which were popularised due to natural Polynesian medicine. Noni fruit is one of the most known natural source of the polysaccharide known as noni-ppt. This compound is believed to be capable of inhibiting the proliferation of cancer cells. This makes it a potential agent which helps treat cancer (nonetheless, it requires more reseach). Furthermore, noni-ppt shows also immunomodulatory properties and may influence beneficially immune function. Since noni fruit has the abillity to stimulate nitric oxide synthesis, it has vasodilating properties. In addition, it contains iridoids which enhance its anti-cancer action. They are also believed to have anti-inflammatory and analgesic properties. This plant comprises also scopoletin, a compound which helps maintain normal blood pressure. The substance is said to have also anti-allergic effects.